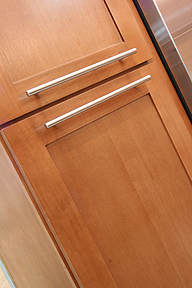 Woodmax Cabinets has been helping homeowners transform their kitchens space to better suit their particular needs by providing affordable elegant cabinets manufactured with the finest raw materials. These cabinets are 100% solid wood and use NO particle board in their construction. The Woodmax ‘Manhattan‘ door style, is the line that we keep in-stock which enables us to offer a much shorter lead time than having to order custom products. 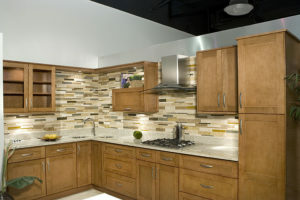 Once the specific items required are in stock, then the kitchen can be delivered and installed immediately. A typical kitchen installation would be approx 5 to 7 days depending on the particular requirements of the job. Note that the demolition of the existing kitchen would add to this time frame. With regards to bathroom vanity cabinets, we stock both the ‘Manhattan’ and ‘Soho Dk‘ door styles. Click here to visit the Woodmax website and view the other door styles/products that can be custom ordered.